The International Symposium The Art of Kamishibai: The Word of the Image and the Image of the Word took place between 10 and 12 May at the Slovenian Theatre Institute and was organized by the Slovenian Theatre Institute, Zapik Association, and Kamishibai Association of Slovenia in cooperation with the Faculty of Education of University of Primorska, the Academy of Theatre, Radio, Film and Television of University of Ljubljana, the Department of Asian Studies at the Faculty of Arts of University of Ljubljana and the Embassy of Japan. 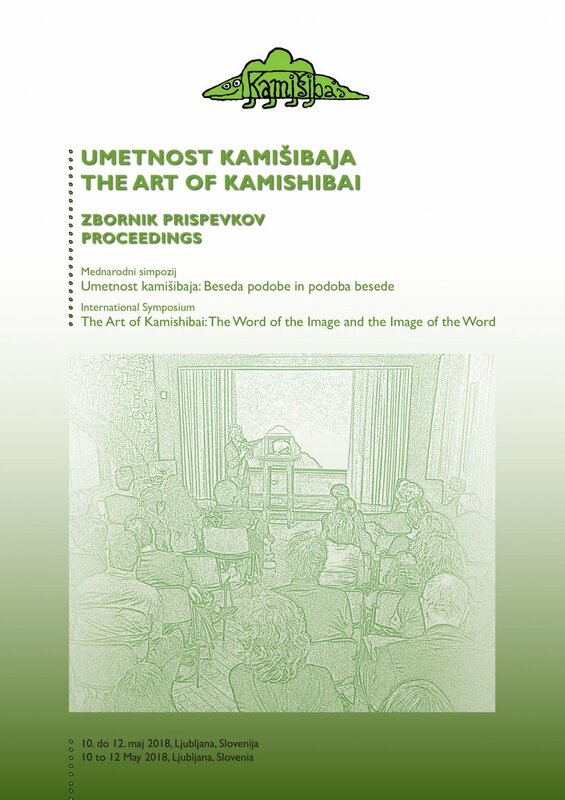 With the online edition of these proceedings and the already published videos of the symposium, we wish to disseminate the collected findings of the international symposium as broadly as possible, both to build the foundations and to upgrade the knowledge of everyone working with kamishibai. As mentioned above, the proceedings will also be complemented in mid-2019 with selected scientific articles in a special thematic number of the Amfiteater journal. Organisers of the international symposium: Slovenian Theatre Institute, Mestni trg 17, 1000 Ljubljana, Slovenija; Zapik Association, Kozarišče 52, 1386 Stari trg pri Ložu, Slovenija; Kamishibai Association of Slovenia, Obzidna ulica 14, 6330 Piran, Slovenija, In cooperation with Faculty of Education, University of Primorska, Cankarjeva 5, 6000 Koper, Slovenija; Academy of Theatre, Radio, Film and Television, University of Ljubljana, Nazorjeva 3, 1000 Ljubljana, Slovenija; Faculty of Arts, University of Ljubljana, Department of Asian Studies, Aškerčeva 2, 1000 Ljubljana, Slovenija; Embassy of Japan in Slovenia, Trg Republike 3, 1000 Ljubljana, Slovenija. The publication was only published in the publicly accessible online version and is accessible on the Slovenian Theatre Institute web page and on ISSUU Platform. Video posnetki simpozija so javno dostopni na Arnesovem video portalu. / Videos of the symposium are publicly accessible at Arnes Video Portal. Contributions are published in English – the working language of the international symposium – as received from the authors, regarding the extent, substance, formal arrangements, references to images included, translation, and proofreading provided by the author. International Symposium and the publication were supported by the Ministry of Culture of the Republic of Slovenia.